Production on Green Lantern is about to go into full swing. A few hours ago we learned they’ve hired an FX house and now we’ve uncovered concept art, showcasing some of the alien characters who may appear in the film. That’s right, I said aliens. This isn’t some Indiana Jones disaster in the making, though for those unfamiliar with the Green Lantern universe it may sound like one. But unlike a lot of other superheroes, much of Green Lantern’s work happens in space and what’s more, he gets his powers from aliens. He’s kind of like The Greatest American Hero, only without the perm. 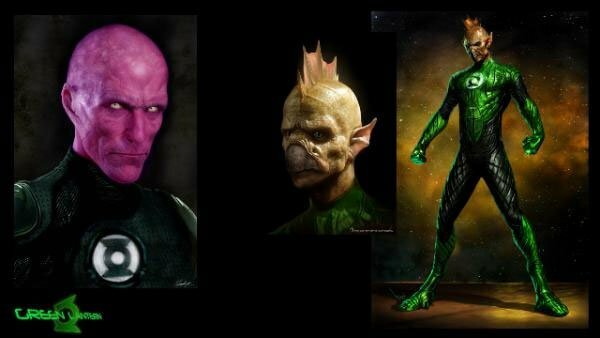 The concept art below comes from CosmicBookNews and The Green Lantern Corps, where you can see it in more detail. First up, is a look at Kilowog. What’s a Kilowog? That’s a Kilowog. In the Green Lantern universe, this guy is the primary trainer of new Green Lantern recruits. Presumably that means he’ll whip Ryan Reynolds into shape. This fishy looking fellow is another member of the Green Lantern Corps who, like Kilowog, is involved in training new recruits. The red-head, according to our commenters, is the Green Lantern who dies and passes the ring on to our human hero.